The pace and style of life here in Cuba is beginning to grow on me as I move to the rhythms of the small and dense city of Santiago de Cuba. The hot and bright mornings are early and invite me to rooftop yoga to greet the sun. The afternoons bring sweltering heat and the opportunity to explore the city’s many beautiful streets, always hustling with food vendors, uniformed school children of all ages, folks selling sunglasses and others clinking cans of fresh-toasted peanuts or ambivalently holding out cigarettes for passersby at a peso. The evenings are when the city lights up, the darkness bringing out musicians, dancers, revellers, stray dogs and Santiago’s notorious prostitutes. Without a doubt the most exciting part of each week has been the early Friday morning agriculture excursions. In the past few weeks four of my fellow students and I have had the honour and pleasure of visiting four different Cuban farms exemplifying different practices in action on the island. In our very first class on Thursday it was emphasized that there are two obligations for human interaction with agricultural land: to obtain a yield -which may be nutritional, spiritual, aesthetic, medical, cosmetic- and to protect the land. The five fundamental practices consist of protecting and improving biodiversity; integration of multiple species and functional elements; creating beneficial relationships; efficiency and resilience. The permaculturist in me was starting to get excited. It is understood that part of the biodiversity of an agroecosystem is not only the cultivated plants and the humans who work with them, but also the livestock and wild animals that live within it, soil biota, fungi, bacteria, non-cultivated plants or “weeds”, pest insects and beneficial insects to name a few. It was fascinating to learn that the principle discussed at the academic level in Cuba -in classrooms and PhD dissertations- and at the farm level is that pest species no longer need to be eliminated but instead need to be managed. What are commonly considered “pests” and “weeds” are only so because we conceive of them as such and allow them to breach a threshold of damage on an ecosystem. Properly managed, these species can play important and unrecognized roles in an agroecosystem; competing with other pests, providing habitat and food for beneficial organisms, acting as decomposers and nutrient-integrators and preventing erosion and moisture-loss to name just a few. These principles and practices were proudly on display at the first “integrated management” farm which I visited. To be clear for those who might have preconceptions about socialist Cuba, these farm tours are not government-run propaganda tours to model farms and villages that one might have heard about in North Korea. There are no bands of smiling children holding hands, actors or flimsy model houses. The sense of camaraderie and solidarity seen and felt between the university professors and the farmers who work together across different worlds is wonderful to behold. Our professors have a clear respect for the work these farmers do in the fields and the farmers in turn respect the concepts and innovations brought to their farms. The professors aren’t afraid to get their hands dirty or to turn over the floor to farmers to explain methods they are experimenting with and challenges they are facing. This sense of solidarity is a beautiful part of the culture here and it might stem in part from the fact that both professor and farmer make a similar wage and experience similar socioeconomic pressures. They might make anywhere up to 16 Cuban Convertible Pesos (about $22 CAD) each month, if that. 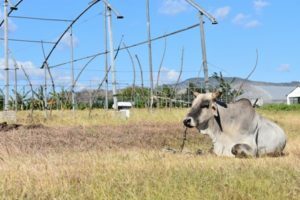 This particular farm lays just a short drive from the Universidad de Oriente Campus in the suburbs of Santiago de Cuba. The small operation provides work for some 40 people and food primarily for those living in the neighbourhoods surrounding it. 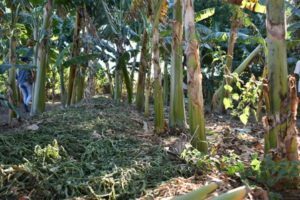 A small plantain plantation lays beautifully cooled in the shade of three neem trees. These trees provide both a passive and active form of pest management. Acting as a companion plant they deter insect pests which abhor the compounds in its leaves. Used in an aged tea the product can be applied to infected plants to kill and deter bacterial and insect pests without the use of artificial lab-produced pesticides. The soil is protected with a thick layer of mulch and nourished with animal manure from cattle which freely roam around the operation and are -to a limited extent- integrated into the food ecosystem. Very interestingly, other companion plants were in use to deter pests without needing to eliminate them completely. Plants like mint, oregano, basil, anis, marigolds and tiny hot peppers served this function beautifully while also providing their own flavourful yields. This farm doesn’t use only animal fertilizers, but includes a small pump house and drip irrigation system to which are added some fertilizers imported from Germany. Fertilizers are used minimally here in response to careful and constant observation of conditions in the greenhouses and the diagnostic characteristics of the leaves. Only a few modest-sized bags of fertilizer could be seen in use in this system which feeds an array of 16 plastic-wrapped greenhouses, down from more than 20 before hurricane Sandy. Each of these greenhouses boasted a different species of economic plant, from tomatoes to peppers to eggplant. But they were never planted alone. In each row of vegetables were planted additional repellant plants, particularly basil and marigolds. 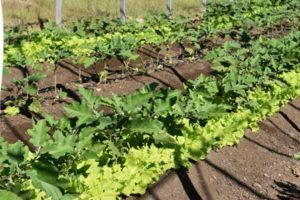 In the case of eggplant, lettuce was used as a companion crop to benefit from the shade provided and to shield the soil from additional evaporation. It was incredible to get a first taste of the food system producing yields here after the challenges of the US embargo, the collapse of the Soviet Union and the starvation of the “special period in a time of peace”. Imagine a food system suddenly unplugged from petrochemicals, pesticides, machinery, seed shipments and international markets. To me it is a sign of the great resilience, creativity, hard work and resourcefulness of Cubans which I think transcends necessity. More than a way of growing food this is truly an evolving culture and value system here. The act of producing one’s own food is not just a necessity of life. It is a profoundly political action which stands in defiance of imperialism, colonialism and violence. Here in Cuba I see food production in this manner as not only an economic necessity, but an act of revolution against the American-dominated global politic. Food production can stand against sexism, patriarchy and gender inequality by empowering women and LGBTQ2S+ individuals. It can stand against poverty, income-inequality and monopoly by bringing the ingredients for life back into the hands of the people. That is what inspires me the most. If we want to bring regenerative agriculture and permanent, resilient and vibrant communities to Canada and beyond it will need to come from vision and passion, not strictly from necessity. It starts in the heart and mind and moves into the culture and practices of the home, the field, the classroom and the nation. No one is going to pull the plug on petrochemicals, pesticides, monoculture and international markets in Canada. We need to see beyond the violence of these activities towards the hope of a regenerative future and begin by simply planting a seed. Overall I’m very impressed with the food system in Cuba. The great majority of food is produced around the cities where it will be consumed, save for Havana which draws from a wider area and has a wider variety of produce. Many efficient practices are used here, like drip irrigation, companion planting, composting and plant or fungus-based pesticides. They are not just used by necessity. I’ve been really impressed with the farm level and academic culture that has grown around sustainable management of land. People really seem to value it. As I said, food is more ubiquitous and celebrated here. Food is a human right entrenched in law and in the (albeit flawed) ration card system. I do think there are great lessons to be learned from Cuba, but I also think it is true that this is an economic necessity for the island. However, it has grown from a necessity to a value system in its own right, and other Caribbean countries are following suit. My professors have expressed a need to maintain this value system even in the face of economic openness with the US. As an island with finite land encroached upon by desertification and rising sea levels Cuba takes soil care very seriously. The first lesson I’d draw is the importance of having more people return to the land and produce food. This doesn’t mean that everyone needs to gain their principle or even partial income from food production, but that more people need to be engaged at least in part in its production. Much like in Canada, Cuba suffers a problem of encouraging young people to work in food production. The age of farmers in Canada grows every year, as does the size of farms, meaning that fewer people are engaged in producing increasingly monocultural crops. Another lesson stemming from this is the need for smaller farms employing more people using soil and water friendly methods. 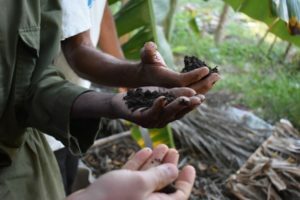 Reversing the trend of growing farms will no doubt be difficult in Canada, but government incentives for soil-building practices and smaller farms for domestic production could help, and the enthusiasm and example of non-governmental interest groups like the Permaculture Guilds can show the way. Stay up to date with permaculture-related events, news, and articles.